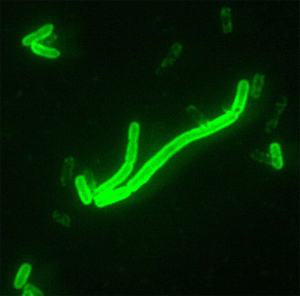 “Black death was not spread by rat fleas, say researchers” – microBEnet: the microbiology of the Built Environment network. Yersinia pestis, Direct Fluorescent Antibody Stain (DFA), 200x Magnification. CDC 2057. Wikimedia Creative Commons Attribution 3.0 License. Reportedly it was “pneumonic” rather than “bubonic” as previously thought. Fortunately it was a very, very long time ago, although there have been many cases more recently than the 14th century. Meanwhile the controversy about influenza transmission as to whether transmitted through air or by fomites rages on. Think about it, if you were an infection control officer or a public health official and an epidemic broke out, if you say transmission is airborne, the economy will shut down. Look what happened in Mexico during the avian flu outbreak a few years ego. It’s a political and an economic issue, not just a public health or scientific one. It is easier to not say it’s transmitted through the air and tell everyone to wash their hands a lot. So how much of our science today is driven by economics and politics rather than public health? 1. I agree it is disturbing when science is inhibited by political considerations. 2. The situation with the flu outbreaks and restricted release of information is one of the reasons PLOS created the PLOS Currents: Outbreaks site — to allow rapid, open discussing of data and analysis related to outbreaks. See http://currents.plos.org/outbreaks/. 3. As for the plague story, I think this was probably oversold a bit. See this article from Popular Science for example: http://www.popsci.com/blog-network/our-modern-plagues/no-rats-are-not-exonerated-black-death by Brooke Borel that tries to counter some of the claims. On your point 3. on “overselling” science….